"When are you going to cut the grass, darling?' is the question that disturbs the peace of too many summer afternoons. So do the whines and grumbles of motor mowers. Next time the question is asked may be a good time to sit back and consider how much of your grass really has to be "cut', how often, and by what means. To judge from the books, being a "lawn expert' is a matter of cutting, rolling, fertilizing, spiking, scarifying, watering, and applying selective weedkillers. The story is told of an American who asked the old gardener in an English stately home about the secret of his success. "Well Guv,' came the reply, "yer mows it once a day, and yer rolls it once a week. And after y'rve done that for a 'undred years - yer does it regular.' No doubt he used a sharp, well oiled, hand-mower. It is still possible to purchase a high-quality hand machine and enjoy something of Old Adam's delight in a perfect lawn. The exercise is good, and must be regular. 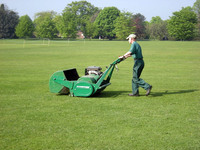 The sound of a hand mower is a counterpoint to the owner's breathing. It conserves fossil fuels and saves one from the indignity of an exercise bicycle. Artificial turf is a man-made synthetic materials made to look like natural grass. Astroturf was the first artificial turf to become well-known when it was used Astrodome in Houston, Texas. Indoor and outdoor sport became the pioneer uses but artificial turf also has amenity applications: when there is heavy wear, a lack of light, a shortage of water, or where maintenance would be problematic. 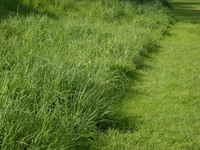 Artificial grass is, for example, often seen on balconies and roof gardens. 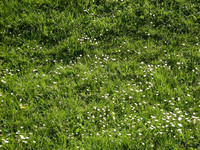 It is non reflective and can have a pleasing colour – but it is not as soft or as cool as grass. But different grades of artificial turf are made for sporting and amenity uses. The latter are nicer looking, softer to touch - and less resistant to heavy wear.